Every person’s body is different; there is no cookie cutter approach to health and nutrition. However, many nutritionists and other health experts recommend starting your day with warm lemon water. It can benefit people with many health issues, from food sensitivities to hormonal imbalances. It’s so easy to do, too! Upon waking, squeeze the juice from a quarter to a half lemon into some warm water (not boiling but not cold). Lemon water helps get your digestive system moving in the morning. Clients often report that lemon water helps them have more regular bowel movements. This alone can have a ton of health benefits. It gets rid of toxins which could otherwise be reabsorbed into the body. These toxins can burden the liver and make it easier to develop health issues. By improving digestion, you assist your body with hormonal balance. Hormones are meant to send a “time-sensitive” message in the body. Once that message has been received, the hormones should be deactivated and passed in stools. When bowel movements are too few and far between, these hormones can be reactivated. They then continue passing around an outdated message, wreaking havoc on your system. Lemons are loaded with vitamin C. The benefits of vitamin C for colds are often talked about. However, its immune benefits expand far beyond cold prevention. As an antioxidant, it helps reduce the amount of free radicals in the body. Free radicals are those unstable particles that can eventually contribute to the presence of cancer in the body. This helps reduce the cancer-fighting burden on the immune system. Pectin, a soluble fibre in lemons, has the ability to make you feel full longer. It expands as it absorbs water. It also helps reduce blood sugar spikes by taking longer to exit the stomach. The slowed digestion leads to slower and more continuous absorption of carbohydrates from other foods. Blood sugar crashes often lead to cravings for sweets, which can knock you off the wagon. As well, the pectin binds to excess cholesterol, making it easier to be removed from your system through bowel movements. The body has the ability to maintain its pH at a level between 7.35 and 7.45. It uses buffers, which are compounds composed of minerals, among other elements. The Standard American Diet tends to push our bodies toward the acidic side. Our bodies then use a lot of important minerals to try to return to an alkaline state. While lemon juice is acidic, it has an alkaline effect in the body. Lemon can help maintain your body’s pH in a more optimal range. Note: warm lemon water does not replace proper medical attention. Please speak with a naturopathic doctor or a medical doctor if you are experiencing any health concerns. “So, is gluten really that bad for you?” This is probably the single question I am asked most often when people find out I am a nutritionist. So, what IS the answer? It’s actually not that simple. There are a few factors that need to be taken into account. Many people I’ve talked to have commented that they don’t believe in non-Celiac gluten intolerance for a number of reasons. Articles and videos have popped up allover the place from varying sources talking about its non-existence. Others are skeptical because it has become such a wide-spread food sensitivity. Others think that “gluten intolerance” is a fancy term for a weight-loss diet. This topic requires a brief overview of food sensitivities in general. It is possible to develop a food intolerance or allergy to any food. A food allergy is caused by a type of antibody characterized as IgE. It manifests itself within two hours of being exposed to the allergen. A food intolerance can be caused by the antibodies IgG or IgA. It tends to display symptoms 6-48 hours after exposure to the allergen. Symptoms can vary from gastrointestinal issues, headaches, skin problems, depression, and many, many others. Its wide variety of symptoms and its slow reaction time make it extremely difficult to pinpoint without testing. Celiac Disease is another kind of reaction, and will not be addressed in this article. Intestines are naturally porous. That’s how nutrients find their way from the digestive system to the bloodstream. In a healthy digestive system, these pores are small and only allow fully digested particles through. However, inflammation (from toxins in preservatives, stress, etc.) can lead to an increase in the size of the pores. This is what is commonly known as leaky gut syndrome. Many food sensitivities develop from frequent exposure to the same ingredients. Our bodies produce enzymes to digest different foods. Eating the same foods over and over depletes the enzyme availability. When the enzyme supply is low, food is not broken down as easily. Undigested food particles, combined with leaky gut syndrome, can lead to large food particles finding their way to the bloodstream. Our antibodies see these large food particles as intruders and begin attacking them. Every time these large particles enter the bloodstream, they are recognized as intruders. Our bodies launching an attack against these so-called intruders causes the symptoms. Gluten is a protein found in different grains, including wheat. Since wheat is one of the most consumed ingredients in the Standard American Diet (SAD), gluten intolerance is becoming more prevalent. Gluten finds its way not only to breads, cereals, crackers, and pasta, but also to many packaged soups, gravies, sauces, flavourings, and most other packaged items you can think of. Many people have heard that a gluten free diet is healthier than the SAD. Some of these people are choosing to follow a gluten free diet for that reason. They may buy packaged gluten free foods that are loaded with corn, sugar, and all kinds of chemical preservatives. So, if you ask me if a gluten free diet is healthier, if this is the diet you had in mind, my answer will be a definite “no”. You may avoid developing a gluten intolerance that way, but you just may develop an intolerance to corn instead. Or rice. Or potatoes. You get the gist. So, is gluten really bad for you? Ultimately, it’s up to you to decide what’s right for your body and your health. Gluten or no gluten, I like to encourage people to follow a whole foods diet that includes a lot of variety. This sort of diet naturally cuts down on gluten consumption. 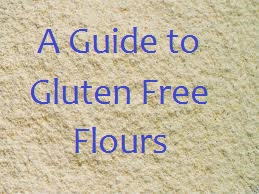 When first going gluten free, or if you’re not gluten free but you want to bake gluten free items, the amount of flour varieties can be quite overwhelming. If you search online, you’ll find all sorts all-purpose mix recipes combining some sort of rice flour, a couple of starches, and sometimes sorghum too. The more daring ones will sometimes have chickpea flour, which to me seems weird. Oh and let’s not forget the gums. Let’s face it though. Even an all-purpose mix can be limiting. When I first discovered my gluten intolerance, about two years ago, I lived in an apartment with no oven. I did manage to bake some cupcakes in my toaster oven, 6 at a time. It’s important to keep in mind that your gluten free batters should be less runny than their gluten-containing equivalents. Have I ever mentioned that my first two batches of cupcakes came out like pudding? In this post, I’ll talk about the different kinds of flour I like to use. Some are more important than others. Some I only use for bread, and I realise that not everyone has the patience to make bread. Also, don’t forget to like my Facebook page! Rice Flour – Your basic gluten free flour. To be used in combination with other flours/starches, unless you just need a tablespoon or two to thicken a sauce. This is pretty much a must have in your pantry. I find that it has the most neutral taste out of all the gluten free flours. White rice flour isn’t very different from brown rice in flavour, but the nutrients have been stripped, so I would recommend avoiding it if you can. Look up all purpose gluten free flour mixes to know in which proportions to use for your typical stuff. Sorghum Flour – Comparable to brown rice flour in taste, though I would say it’s a tad stronger. Its texture is usually a bit grainier, and it’s a bit of a heavier flour than brown rice flour. When in a pinch, unless you’re making something very delicate, you can often use sorghum flour instead of brown rice flour. I like it in breads. Potato Starch and Tapioca Starch – These starches are usually used in all-purpose flour mixes. They help lighten the mix. Use a combination of the two for best results. You may want to tread lightly when using one of these starches in a recipe that calls for cornstarch because the texture may be off a little. Arrowroot Powder – This is my favourite starch. It’s a bit pricier than other starches, but it’s virtually tasteless. I like to use this in custard and gravy because it will thicken things nicely, unlike, say, tapioca starch, which might give your sauces a weird gummy texture. Almond Meal/Flour – Almond meal, which is coarser than almond flour, is great as a substitute to bread crumbs. It can also be used in baked goods where a fine flour isn’t needed. I wouldn’t use it in cupcakes, but it’s great for brownies or breakfast muffins. Almond flour, on the other hand, makes great cookies and pancakes. A bonus: it has a low glycemic index. Teff Flour – A dark flour with a nice, nutty flavour. Good for breads. It’s a bit finer than other flours. This is the flour used in Ethiopian ingera. It can also be used in pancakes. Buckwheat Flour – Perfect for pancakes (try these banana buckwheat pancakes), but also good in all sorts of different goods. Keep in mind that it has a bit of a stronger flavour. No gum required. Coconut Flour – Best if used with eggs or as a component in a flour mix. If using it in a recipe that doesn’t call for it, the liquid content needs to be increased by the amount of coconut flour you’re using (ex- if subbing another flour for a 1/2 cup of coconut flour, increase the liquid by a 1/2 cup). Beware of using flax eggs in a coconut flour recipe that calls for eggs. It doesn’t seem to bind as well. Chickpea Flour – Has a distinct flavour. I only use it for middle eastern and Indian meals (try this pudla recipe). Some sweet recipes call for it, but I can’t seem to enjoy it in sweet recipes. I don’t even like it in breads as part of a blend of flours because of its strong taste. Millet Flour – An inexpensive flour that can be used in flour blends for a nutty flavour. It’s similar to brown rice flour in chemical properties but tastes stronger. Xanthan Gum and Guar Gum – These are often necessary in gluten free baked goods to act like the gluten – it’s the glue that keeps everything together. Xanthan gum is derived from corn so it can be problematic for people with corn sensitivities. Chia meal – I’ve been experimenting with replacing gums with chia meal, which is just ground chia seeds. It takes a LOT more chia meal than gum to achieve the same effect (about 6 times as much, from what I’ve noticed so far). The idea is to add water to it to activate its gelatinous texture. It also makes a good egg replacer. Combine 1tbsp chia meal with 3 tbsp water for each egg in a recipe. Let sit 5-10 minutes before adding it to the mix. You can also use ground flax meal in the same proportions, for an egg substitute. Okay, I’m aware I’m starting to publish an awful lot of posts that don’t relate directly to food. I’m a fan of anything healthy, even if it’s not nutrition related. In my defense, all the alternatives to cosmetic chemicals I’ve been using have been made from food items. You can read about how I gave up shampoo and the flaxseed hair gel I make. I read quite a bit about using castor oil as an alternative to harsh facial cleansers. I’ve had acne since I was ten years old and I feel like I’ve tried everything since. I even tried taking Accutane for a month, but stopped when it started causing me health problems. My organs have never quite forgiven me, even though it was just about three years ago. My night vision is also permanently affected. If you’re considering Accutane, I would advise against it. I’ve tried a variety of facial cleansers, each one more expensive than the last. The trouble with these is that they’re loaded with harsh chemicals that dry out your skin. Dead skin cells accumulate and clog your pores, causing pimples. The right way to help acne is to moisturise your skin while cleaning it. This is where castor oil comes in (with a bit of help from olive oil). The recommended proportions for acne-prone skin are 3:1 castor oil to olive oil. If you don’t have acne prone skin, I suggest doing a bit of research online to figure out the proper proportions for your skin type. To do this skin cleansing routine, if you have anything longer than buzz-cut length hair, use a head band or a hair tye. Trust me. Castor oil is thick. It will get in your hair and not come out without a shower. I pour a pretty small amount of the mixture in the palm of my hand, rub my hands together, and start massaging it into my skin using circular motions. I then turn on the hot water (as hot as it will go), wet a facial towel, then press it flat to my skin for a few seconds to “steam” it. I then gently rub the oil off, repeat the steaming process, and rub the remainder off. I think the bottle of castor oil I bought cost about $10. I expect it will last me at the very least one year, and that’s just being conservative. Trust me, a little goes a long way. I found it with the avocado oil and other similar oils in the beauty section of my health food store. Little bonus: if you’re doing the baking soda thing instead of shampoo, rub a bit of castor oil on your scalp once a week about 10-15 minutes before showering to reduce itchy scalp and generally improve the health of your hair. Back when I thought I may have Celiac Disease, I spent hours on the internet doing research about anything and everything which remotely touched on CD. I looked up sources of gluten and was horrified to find out that everyday products like shampoo and lipstick can often contain gluten. Once I found out I didn’t have CD, finding alternatives to cosmetics didn’t seem like such a priority anymore. Since I’ve been seeing a naturopath, my health has been a lot better. I figured that, since I’m feeling better, I could now work on improving other aspects of my health. I’ve been working on removing all the “crap” from my diet for the last year, and I recently decided to go one step further than my diet. I am now eliminating, one by one, all the products that contain all kinds of harsh chemicals and carcinogens. Step 1: Shampoo/conditioner. Before you go getting all grossed out, let me mention that I use a natural alternative to shampoo. You may have heard of the “No-poo” movement. There are different ways of going about it. I chose what appears to be the most common method according to my very good friend, Internet (we go way back). My new shampoo consists of baking soda (make sure it’s aluminum free) and water. Different people use different proportions. I’m working on reducing the amount of baking soda required. I’ve read of anywhere between 1:4 and 1:16 of baking soda to water proportions. Since baking soda is alkaline, it’s a good idea to balance it out with an acidic substance. Most people do this with apple cider vinegar. I guess you could call me a conformist because I, too, use apple cider vinegar. I promise, if you decide to try this, you won’t smell like vinegar. Unless you don’t rinse it out, that is. It’s very easy to rinse out. And now about the dryness. There are all kinds of natural hair “treatments” or “masks” you can do. The only ones I’ve tried and can approve are the following: coconut milk (the full fat stuff), and mashed avocado and egg whites. The avocado and egg whites one left my hair looking kind of greasy, but after I washed my hair again, made it really soft and shiny. You can find all sorts of other ideas online, but since I haven’t tried them, I will not recommend them. Resources online mostly seem to agree that it takes about three weeks to adjust. Your hair may be greasy at first, but it should balance out after three weeks. That’s exactly how long it took for my hair. On the 3 week “anniversary” of my switch, I noticed that I didn’t need to wash my hair according to my usual schedule anymore. I’m still experimenting with homemade hair gel. Because I haven’t perfected it, I wouldn’t want to tell you all about it, and have you looking like you just got an electric shock. If you’re curious, my buddy Internet will tell you all about flaxseed gel, or agar with aloe vera gel. If you spend any amount of time on Pinterest or you just like to browse the internet for food related stuff, you may have already heard of freezer bags that you simply pop into your slowcooker in the morning. If you haven’t, this is why I’m writing this post. When I know I’m about to become really busy for a good period of time, I like to take a few hours to make freezer bags. I make a shopping list ahead of time to make sure I buy everything I need, and only what I need. I typically buy a bag of onions, a bunch of carrots, a bunch of celery, a bag of frozen green beans, a few zucchinis, a few bell peppers, and sometimes cauliflower or broccoli. If stewing beef cubes or chicken legs are on sale, I may also buy some of those. When I get home, I wash all my veggies at the same time. I keep the celery and the carrots in bunches for faster cutting. You need a nice big knife for this. And watch your fingers. You don’t want finger pieces in your freezer bags. Especially if you’re doing vegan freezer bags. When I’m done cutting veggies, I save the scraps to make veggie broth, except if I’m using broccoli or cauliflower (they apparently make broth bitter). I throw the sliced veggies into bags, add fresh spices directly to the bag (such as minced garlic or ginger cubes), and close them up nicely. When I’m ready to use them, I take them out of the freezer, empty the contents of the bags into the slowcooker or a large soup pot, and add broth or sauce. I stuff my freezer quite a bit to fit all these freezer bags of goodies. If you use meat, make sure you place it at the bottom of the freezer. At the end of about two hours of work, my dishes consist of two knives, a cutting board, my garlic mincer, a cup, and my mandoline. I have tons of meals prepared, and I only have to do the dishes once.